Each year, thousands of children are injured while crossing or walking along the road. A study conducted by the National Highway Traffic Safety Administration reports that in 2012, over 76,000 pedestrians were injured and of those injured, 11,000 were children ages 14 and younger. Children are more likely to be injured when walking to and from school. 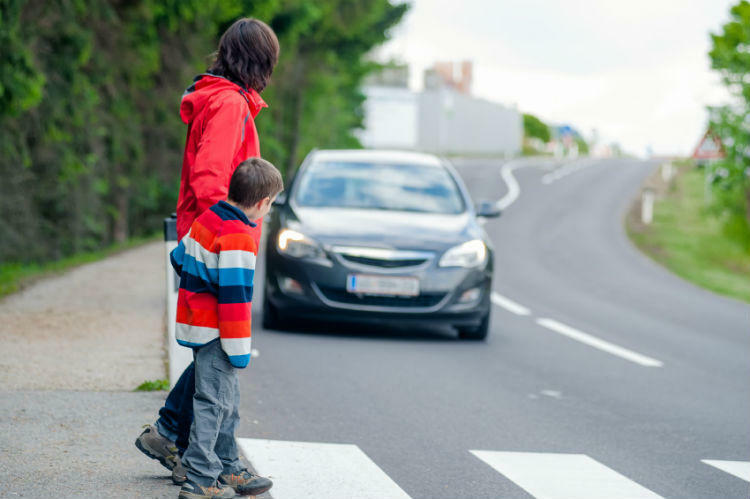 According to St. Louis car accident lawyers, these pedestrian accidents can be prevented for both adults and children by following these safety tips. • The road should always be crossed at recognized intersections or corners ensuring that you are visible to motorists. Many accidents occur when the pedestrian crosses the road at an unmarked place. • Before crossing the road, look both ways to ensure that there is no vehicle in the vicinity. While crossing, keep looking in the direction of incoming traffic. • While on the crosswalk, move deliberately and do not run as you may trip and fall down. • Always walk on a sidewalk. If you have to move on to the road, you should walk so that you are facing the traffic. • If you are walking on the road after dark, carry a flashlight and wear light-colored clothes or clothes with reflectors. • Children under ten years old should always be escorted while walking on the road. They lack visual acuity and depth perception to judge the distance and speed of incoming vehicles. Though children under ten years old may be responsible, they are not always able to make a correct decision in risky situations. • You must always walk on the sidewalk. In places where a sidewalk is not available, you must walk on the extreme left of the street facing the oncoming traffic in a single file. • You should cross the street at designated crossings or corners. All traffic rules and signal lights must be followed and always pay attention to school crossing guards. You should never cross the street from between cars. • Before crossing the road, look towards your left, then right, and then left again so that you are aware of the presence of any closing vehicles. While crossing the street, always look towards the oncoming traffic. • Stay visible while crossing the road during dusk or when it is dark. This can be achieved by carrying a flashlight, wearing light-colored clothes, or clothes with reflectors. When you are buying a new jacket for your child, look for patches of bright colors or reflectors. • If your child drops a toy on the street or a pet goes on the street, your child should never venture out on the street, but should seek assistance of an adult. If you are a parent of a child injured in a car accident, contact The Hoffmann Law Firm, L.L.C. at (314) 361-4242 for legal guidance.